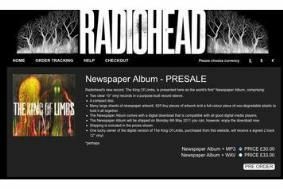 New Radiohead album 'The King of Limbs' available for download a day early | What Hi-Fi? You can buy the digital version as a 320Kbps MP3 file (£6) or as an uncompressed WAV file for £9. Radiohead is also releasing the record as a 'Newspaper Album' which comprises two 10in vinyl records, a CD, a digital download and "many large sheets of newspaper artwork, 625 tiny pieces of artwork and a full-colour piece of oxo-degradable plastic to hold it all together". If you've pre-ordered the vinyl version you'll get it on May 9th, although you can download the digital version now. The Newspaper Album + MP3 download costs £30, with the WAV file it's £33. To buy your download now, head on over to the Radiohead website. The band famously released its last album, In Rainbows, as a download for which you could pay as much or as little as you wanted. This time the price is fixed.